An article in the journal of the Australian Skeptics has sought to refute a creationist claim that the Three Sisters formed during Noah’s Flood. These impressive rock outcrops are a popular tourist icon near Sydney, Australia. Instead of a refutation, it turns out that the Skeptic article enhances the creationists’ argument. For example, the article tacitly acknowledges that none of the geological environments previously proposed is workable, because the author does not attempt to defend any of them. But the new, previously unpublished model offered turns out to be an inferior match of the geological evidence. Carbon-14 from wood is still evidence that the geological strata are young because the explanation that the wood was an iron concretion is impossible. The article does not even try to refute the strong evidence provided by the shape of the landscape. The creationist case relies, not on one or two speculative resemblances, but a whole host of consistent evidences that tie in beautifully to the sequence of events involved in Noah’s Flood. The Skeptic article does nothing to diminish the creationist case, but much to strengthen it. Creationists have claimed that the geology of Australia’s Three Sisters, provides compelling evidence for the global Flood of Noah,1 a claim that a recent article in the journal of Australian Skeptics has sought to refute.2 The Skeptic is not a peer-reviewed geological journal, nor would it profess to be. However, a geologist wrote the article and it is now available on the web, so a response to the criticisms is given here. But before we consider the geological evidence, we need to clear away some peripheral distractions. Figure 1. An alluvial fan. A stream or river deposits the alluvium (gravel, sand, silt, clay and organic matter) onto a valley floor when it emerges from a steep, narrow canyon (after Stanistreet and McCarthy).21 Note, vertical exaggeration of sketch is about 300 times. This is the classic religion-versus-science tactic, regularly employed to sidestep creationist arguments. Defining science in this way disqualifies the biblical worldview from the outset, dismissing scientific arguments without addressing them. We are all sceptical when governments ban opposing political parties. And we should be sceptical of skeptics claiming that this debate is just about science—about objectively considering alternative hypotheses and weighing the evidence. Skeptics are quick to accuse creationists of being biased but won’t acknowledge that they are biased too. The conflict is between the Christian faith, which gave the West its values and heritage, and the new religion of secular humanism. Simply put, one side accepts the Bible as authoritative, the other does not. A favourite political tactic is to attack the credibility of the opponent. The article in the Skeptic does just that. Even the subtitle to the article claims that ‘creationists don’t know which bed they are in’, implying, among other things, that creationists are ignorant of geology. However, the article reveals the opposite. It says the Three Sisters are ‘part of the rock unit known as the Hawkesbury Sandstone’. Not so. They are exposures of the Banks Wall Sandstone, which is part of the Narrabeen Group.3 The creationist article always described the Hawkesbury Sandstone as ‘overlying’ the Three Sisters.1 So, the author of the Skeptic article has confused his stratigraphy, not the creationist. Figure 2. The Kosi River fan in northern India (after Singh et al., ref. 10). The purpose of this enthusiasm is supposedly to ‘demolish the patently absurd “geology” of the creationists at every opportunity’, which does not sound like a careful, unbiased scientific approach to the data. The Skeptic article similarly attacks the credibility of the Bible, referring to Noah’s Flood as ‘some magically created worldwide flood’ and ‘fairytales’. We should not allow these assaults on credibility to distract us from properly weighing the evidence. So let’s look at the geological evidence and how it is interpreted. As the creationist article explained, the immense size and lateral extent of the geological formations, which the Three Sisters are part of, point to an unusual depositional environment in the past. Moreover, the ever-present cross-bedding in the sandstone strata, visible in the cuttings and cliffs around Sydney, means that deposition was from fast, deep-flowing water. Any tourist can appreciate these geologic features. But for 150 years, geologists have struggled to match a satisfactory depositional environment to these strata, based on normal, everyday geologic environments. The more recent suggestions have tended toward the exotic and have a distinctive catastrophist flavour. These developments do not surprise creationists because the geological features are what we would expect from the global catastrophic Flood of Noah as described in the Bible. The article in the Skeptic tries to avoid the implications of large-scale deposition, first by poking fun. ‘Be impressed by big things.’ ‘Dr Walker is trying to impress his audience with large numbers.’ Then the author suggests that large-scale deposition is easy to explain. ‘It seems that he has not bothered to do any research into modern environments that geologists would consider similar to that which produced the Hawkesbury Sandstone.’ The article then suggests that the scale of the Hawkesbury Sandstone is easily explained as a stream-dominated fan (figure 1). Figure 3. The Kosi fan is geographically large but nowhere near as large as the Sydney Basin (after Singh et al., ref. 10, fig. 1, and Jones and Clark, ref. 3, p. 9). No geologist has previously suggested a stream-dominated fan. I wonder if the author of the Skeptic article would also say that these geologists have ‘not bothered to actually do any research into modern environments’. Interestingly, the author of the Skeptic article failed to examine Dr Conagahan’s model, saying, ‘I have not looked at the newspaper article.’ But that does not change the fact that creationists are not the only geologists who see that the evidence points to large-scale watery catastrophe. By proposing a stream-dominated fan as the past depositional environment, the author of the Skeptic article effectively acknowledges that none of the previously proposed environments is satisfactory. I agree. But I doubt that many geologists will embrace this new depositional model either. Let’s see why. Although the Kosi fan covers a large area, it is still not as large as the sediments within the Sydney Basin (figure 3).7,8 If the largest modern fan is not large enough,9 how can someone claim that explaining the vast size is ‘no problem’? Figure 4. The thickness and shape of the Kosi fan are starkly different from the sediments of the Sydney Basin. The cross-section of the Sydney Basin is parallel to the coast across the mouth of the basin along a SSW-NNE line (obtained from the Sydney 1:250,000 map, ref. 11, combined with Jones and Clark, ref. 3, p. 9). The cross-section of the Kosi fan is across the widest part of the fan through Supaul and Purnea (interpreted from Singh et al., ref. 10, fig. 1 and fig. 3, recognizing that the longitudinal section of their fig. 3 is along the Kosi River toward the edge of the fan). Figure 5. Looking like a complicated braid, a braided stream forms a tangle of waterways, islands and sandbars as it splits into multitudes of channels that fork and rejoin. Plentiful sediment load and variable discharge provide the conditions where braided streams develop. This photograph was taken in 1986 at Leslie Hills, North Canterbury, NZ. The Skeptic author uses another tactic to try to neutralize the creationist argument about the large scale of sedimentation. He claims that I have been inconsistent in the way I have used scale to classify rocks. Specifically, he charges that although I have argued the Hawkesbury Sandstone is a Flood deposit because of its large scale, I have previously argued that the much-larger Karumba Basin is post-Flood. Such a position would be inconsistent, but I have never claimed the Karumba Basin is post-Flood. The author is referring to a letter I wrote to The Australian Geologist,17 which mentioned the famous Riversleigh fossils in Queensland. These fossils are characteristic of present-day Australian fauna, and so they almost certainly formed post-Flood, after the land animals migrated to Australia from the Middle East. But they are contained within limestones of the Karumba Basin, and, judging from its scale and relationship, the basin is probably late-Flood. To have post-Flood vertebrates enclosed with a Flood deposit would seem to pose a problem. Figure 6. 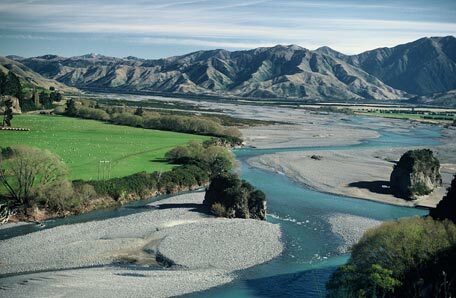 Situated at the bends of meandering streams, oxbow lakes form when the stream bypasses its channel. Silt rapidly fills in the ends to form an arc-shaped, stagnant lake. However, the apparent problem is easily resolved when we examine the context of the fossil deposits.18 I explained this in my letter to The Australian Geologist, ‘The fossils in the limestone are actually contained in lenses which were once caves and pools formed well after the limestone was deposited.’ Thus, after the limestone was deposited, river channels, caves, pools and underground conduits dissected it. The animal remains were trapped in these spaces and fossilized. In other words, the lenses are post-Flood, not the limestone of the Karumba Basin, which is a Flood deposit. The article in the Skeptic also tried to discount the import of a carbon-14 analysis on wood from the Hawkesbury Sandstone.19 This returned a date of 33,720 ± 430 years and provided objective, experimental evidence that the sandstone is only thousands of years old, not 225–230 million years as conventionally quoted. Although the carbon-14 analysis was performed by a reputable commercial laboratory, the Skeptic article claimed that ‘the sample looked more like an iron concretion than a piece of wood’. It’s strange that an experienced carbon-14 dating laboratory would report carbon from an iron concretion. The Skeptic article also said the carbon-14 result ‘could easily have been contaminated by ground water’. But the writer ignored the associated carbon-13 analysis, which is not consistent with ground water contaminating the wood. These sorts of arguments about the carbon-14 analysis simply demonstrate what creationists have said in many places. Geologists accept radioactive ages only when they agree with what they already believe the age to be. However, the vertical logs are at least 3 m long and enclosed within only one or two beds of a large-scale sandstone formation. These features point to vast and fast water flows. The Kosi fan does not have similar logs standing vertically in the earth waiting to be buried by gradually accumulating sediment. Neither do large logs commonly protrude vertically from the beds of braided-river environments. Thus, in spite of the author’s attempt to brush off the evidence, it is not possible to dismiss so easily the significance for catastrophe of the vertical trees within thick, cross-bedded strata. Figure 7. Sediments comprising the Great Artesian Basin, overlying the Sydney Basin to the north, cover a much larger area. If a stream-dominated fan is not adequate to explain the Sydney Basin, it is even less applicable to the Great Artesian Basin, which contains geological formations similar to the Hawkesbury Sandstone. The form of the landscapes provides more evidence consistent with the Three Sisters forming during Noah’s Flood. The creationist article discussed the landscapes but the Skeptic article did not address them at all. In broad terms, the landscape in the Blue Mountains consists of an uplifted plateau subsequently dissected into wide valleys with steep cliffs—a pattern easily explained from a biblical model. The plateaux represent a huge planation surface shaved flat during the second half of the Flood as receding floodwaters flowed in sheets from the continent. The escarpments and large valleys eroded later in the Flood when the volume of water decreased and the flow was restricted to large channels. The rivers and waterfalls that now occupy valleys are minuscule compared with the volume of waters that carved the landscape during the Flood. Underfit rivers are the norm around the world, but we would expect conformable-fit rivers if millions of years were available to reach an equilibrium position. It is interesting that Darwin, when he visited Australia in 1844, thought the idea that rivers cut the gorges was ‘preposterous’.20 He proposed that the main agent of erosion must have been a retreating sea—remarkably similar to the creationist position. The article in the Skeptic has not refuted the creationists’ claim that the Three Sisters provide compelling evidence for Noah’s Flood. The depositional features of the sediments are different from any depositional environment we see on the earth today, including the author’s suggestion of a stream-dominated alluvial fan. The fact that the author proposed a new, previously unpublished model, rather than trying to defend one of the existing ones, suggests that he thinks none is adequate to explain the geology. the form of the landscapes such as the extensive plateaus, and wide, deep and steep valleys. The case for the Three Sisters forming during Noah’s Flood is strong. It relies, not on one or two speculative similarities, but a whole host of consistent evidences that tie in beautifully to the sequence of events involved in the global catastrophe. Walker, T., 3 Sisters: evidence for Noah’s Flood, Creation 25(2):38–42, 2003. Blake, P., Creationist weds Three Sisters: evidence that creationists don’t know which bed they are in, the Skeptic 24(1):49–51, 2004. Jones, D.C. and Clark, N.R. (Eds. ), Geology of the Penrith 1:100,000 Sheet 9030, New South Wales Geological Survey, Sydney, p. 10, 1991. Bembrick, C., Three Sisters defamed, the Skeptic 24(2):67, 2004. Jones and Clark, ref. 3, p.14. Woodford, J., Rock doctor catches up with our prehistoric surf, The Sydney Morning Herald, p. 2, 30 April 1994. Collinson, J.D., Alluvial sediments; in: Reading, H.G., Sedimentary Environments: Processes, Facies and Stratigraphy (3rd ed. ), Blackwell Science, Oxford, UK, p. 60, 1996. Jones and Clark, ref. 3, p. 14–15. The Kosi fan is the largest stream-dominated fan of a class of fans that are deposited subaerially—i.e. under air on land. Much larger fans are deposited under water beyond the edge of the continental shelf at the mouths of the earth’s major rivers, the largest being the Indus deep sea fan. These fans have a different character and are even less analogous to the Hawkesbury Sandstone. Singh, H., Parkash, B. and Gohain, K., Facies analysis of the Kosi megafan deposits, Sedimentary Geology 85:87–113, 1993. Sydney 1:255,000 Geological Map Series, 3rd ed., 1966. The Sydney Basin, Australian Museum, <www.amonline.net.au/geoscience/earth/sydbasin.htm>, 6 June 2004. Bioturbation is the churning up of sediment by organisms such as worms or ants. Usually, bioturbation destroys any layering or structure in the sediment. 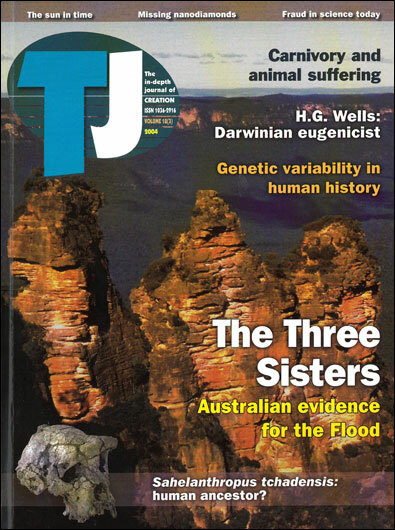 The creationist article about the Three Sisters, ref. 1, describes these briefly. Day, R.W., Whitaker, W.G., Murray, C.G., Wilson, I.H. and Grimes, K.G., Queensland Geology: A companion volume to the 1:2,500,000 scale geological map, (1975), Geological Survey of Queensland, Publication 383, Brisbane, p. 127, 1983. Walker, T., The Great Artesian Basin, Australia, Journal of Creation 10(3):379–390, 1996. Walker, T., Geology and the Bible—an answer, The Australian Geologist 110, p. 8, 31 March 1999. Archer, M., Hand, S.J. and Godthelp, H., Riversleigh, Reed Books, Sydney pp. 44–53, 1991. Snelling, A.A., Dating dilemma: fossil wood in ‘ancient’ sandstone, Creation 21(3):39–41, 1999. Jones and Clark, ref. 3, p. 104. Stanistreet, I.G. and McCarthy, T.S., The Okavango Fan and the classification of subaerial fan systems, Sedimentary Geology 85:115–133, 1993.